Acorn starch powder: legal or not? I like to peruse the local Asian grocery. There is always something interesting to discover and my last trip was no exception. 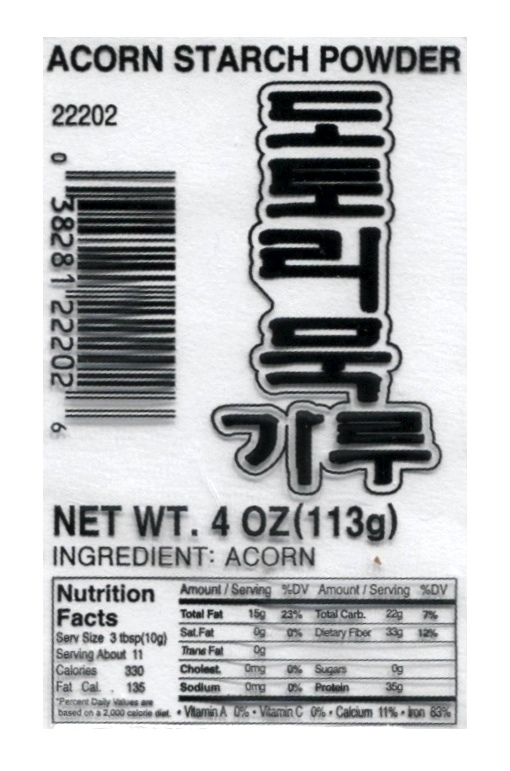 My newest discovery is acorn starch powder or dotori ggaru (도토리가루). The word “starch” gives me pause, but it’s made from a nut so is it legal or not? I’ll get to that, but first take a look at the label. ALLOWABLE NUTS – Purchased with or without shells. Almonds, pecans, Brazil nuts, filberts (hazelnuts), walnuts, unroasted cashews, boiled chestnuts.Less than a dozen nuts are even listed and chestnuts must be boiled first. If you look on the BTVC website, dried chestnuts must be soaked and cooked until soft to be legal, just like a lentil or dried bean. Presumably this is to remove some of the starch. Chestnut flour is listed as illegal, but with no explanation. I guessing that the reasoning is the same as for bean flour. In researching acorn starch powder I learned about acorn flour. Acorns are very bitter due to the tannin they contain and to make the acorn flour palatable, the acorns are soaked to remove that tannin. That’s similar to the treatment we have to give lentils. It seems that they are generally ground up first then soaked, but not overnight as per the BTVC instructions for lentils or dried beans. Acorn starch powder makes a decent thickener as I discovered when I added it to some pan drippings. That raises a red flag in my mind as well. I searched my usual sources for information on this topic and came up empty. No one has an answer from Elaine. The most damning bit of evidence comes from wikipedia though. If you take a look at an article about a Korean noodle called dotori guksu you find that the above assumptions about making acorn flour take you in the wrong direction. The section on the differences between starch and flour bases spells it out neatly. I hadn’t made a distinction between the terms flour and starch and therein lies the answer. Even though those two terms might be used interchangeably, they mean very different things. Acorn flour is the meal or nutmeat that is left after the soaking is done. Acorn starch is the substance that is leached out of the acorn meal along with the tannins. 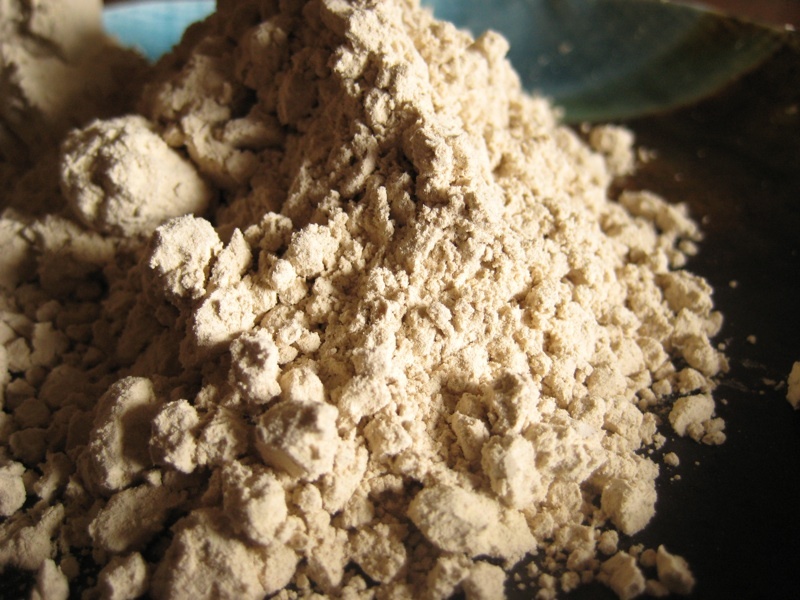 Acorn flour might conceivably be legal, but acorn starch powder is another story. So the answer to the question posed by this post is pretty clear. I would consider acorn starch powder to definitely be illegal. In my quest, I searched breakingtheviciouscycle.info, pecanbread.com, and the pecanbread and BTVC-SCD groups on Yahoo. I learned about making acorn flour from Tactical Intelligence.
. I make my own acorn starch. It a by product of acorn meal. In the cold leach process, after soaking the meal for weeks and pouring off the tannin daily, the meal is strained thorough butter muslin to dry it. Nearly all the tannin is gone at this point, and the meal can be tested by its palatability. If its bitter it was not leached properly or long enough. Tannin is in many foods and it is not a toxin unless concentrated. The fine particles that make it past the butter muslin will after a day or two settle into a thick sentiment at the bottom. So I save the water for a day or two to recover the starch. It is a very useful product along with the meal and flower. Not sure what it would be illegal. The starch that remains from the leaching process is definitely not SCD legal. I think that the nut meal that remains could very likely be SCD legal. And neither is the starch in cashews or peanuts, the legume.